Mana says "Just do it"
The 2018 competition rules/handbook is available here. Please contact your local Association for entry forms and venue details for your Competitions Awareness Seminar and Regional Competitions. This year, the Editorial Stylist of the Year Awards (including a new award dedicated to the late Derek Elvy) and the Patrick Cameron Instagram Challenge photographic suites were included in the Creative Awards section of The Industry Awards. 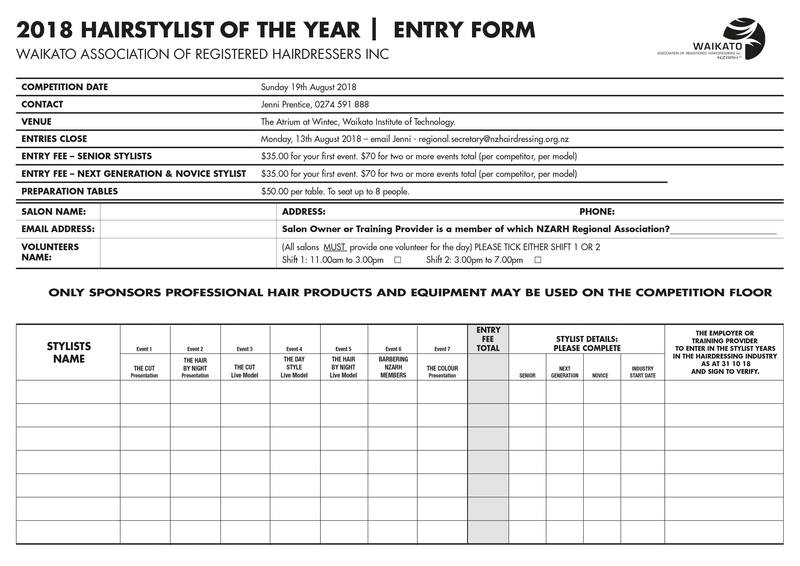 Brought to you by Kitomba Salon & Spa Software, NZARH and HITO, these coveted awards celebrate both individual and team success. 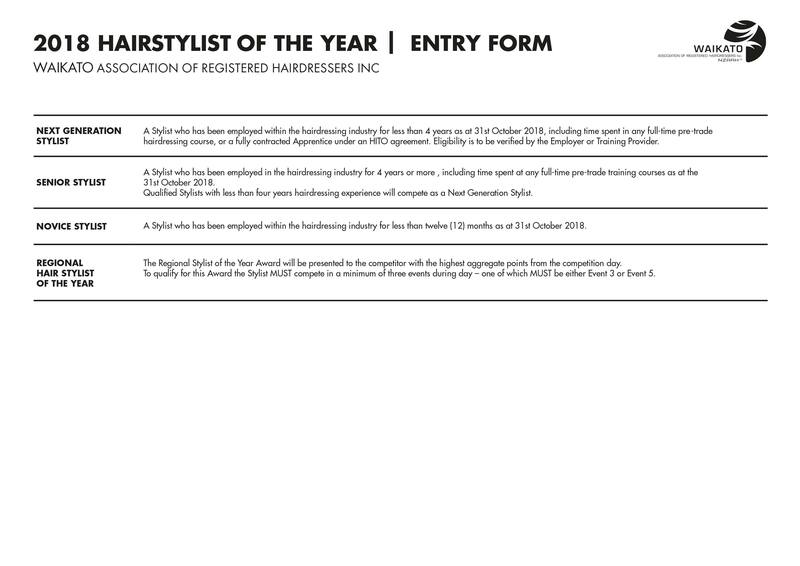 With awards for business success, exceptional training, great workplaces, apprentices and creative styling, there’s a category for every hairdresser, barber or beauty therapist to enter. The winners for 2018 were announced at The Industry Awards event on 11 November 2018 in Auckland. Congratulations to everyone who entered! Danny Pato is three-time back-to-back winner of Hair Expo New Zealand Hairdresser of the Year (2016, 2017 and 2018), and the co-founder and creative director of multiple award-winning D&M Hair Design in Ponsonby. Danny is an acclaimed editorial session stylist, directing the hair for fashion weeks from Auckland to New York and for editorial shoots in magazines such as Vogue, Fashion Quarterly, Oyster and Remix. He is a favourite choice for local fashion designers, having worked on campaigns and shows for Karen Walker, Nom*D, Huffer, Kathryn Wilson, Ruby, Moochi and Adrian Hailwood, and each year directs the graduate show for NZ’s leading fashion design school at AUT. He regularly contributes industry commentary for fashion and beauty media and is actively involved in salon sustainability and charity initiatives, most recently raising $28,000 for KidsCan. Brad Lepper is a globally recognised stylist and is one of the core International Artists for Sebastian Professional and a ghd Brand Warrior. Based in Auckland New Zealand, Brad travels regularly with Sebastian Professional and ghd and in the last couple of years he has worked in New York, LA, Barcelona, Delhi, Madrid, Berlin, Dublin, Sydney, Melbourne, Wellington and Christchurch to name a few. 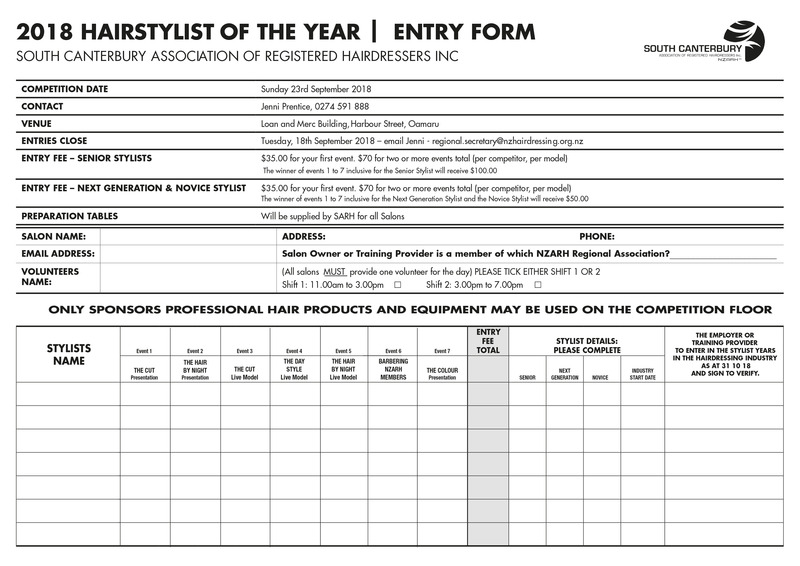 To keep his achievements very very brief, Brad has been named Finalist in the Australian / New Zealand Hair Expo Men’s Hairdresser / Barber of the Year 2016, was awarded Silver in the Wella Trend Vision Award 2015 and 2016, NZ Men’s Hair Stylist of the Year at Industry 2014, 2014 L’Oreal Colour Trophy Supreme Hairdresser of the Year finalist, led his salon team to be named New Zealand Creative Team of the Year 2017 and has received a whole host of industry awards and accolades over the course of his career. 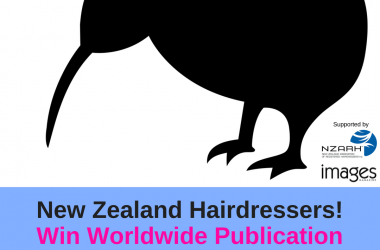 He is the personal hairstylist for some of New Zealand’s top celebrities and musicians. He has directed hair for shoots with the All Blacks Rugby World Cup Jockey advertising campaigns, shoots for magazines such as Remix, Mindfood Style, The Journal, Viva, and Woman’s Day. 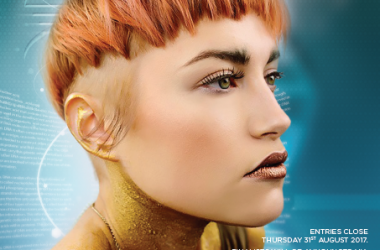 Brad also represented Sebastian Professional in the battle of the brands show at the Wella Australia New Zealand Trend Vision finals in 2017. With over seventeen years of industry experience, Brad is also the Creative Director and Owner of Auckland based salon, French Revolver Studio – a concept salon created by inspiration from his travels and observations to start something fresh by fusing elements of art and fashion to form a creative hub. Lex Buckley together with partner Sheryl are the publishers of the well known and well read Images Magazine. Now in its 17th year, Images has earned an international reputation and was awarded an Intercoiffure Global Press Award Paris in 2009. This will be Lex’s 3rd year judging the Editorial Stylist Awards – as a stalwart of the industry and with a keen eye for detail, we’re excited to have him on board again this year and we truly value his experience and support. Four time Australian Hairdresser of the year, Joey Scandizzo’s unwavering professionalism and creative vision has seen him become an icon of the Australian Hairdressing Industry. His impressive career has seen him style a rich list of celebrity clientele whilst making increasing appearances on TV as Hair Director in such popular shows as Australia's Next Top Model, Beauty & The Geek, The Biggest Loser (Make Overs), Naomi Campbell’s The Face, The Project, The Morning Show and USA’s Shear Genius. As editorial session stylist, Joey has delivered finesse and integrity to countless glossy publications, beauty websites and blogs and has adopted the role as director for several fashion weeks. Most recently Joey took on the role of Co-Creative Director for the ELEVEN AUSTRALIA haircare brand and was Hair Director for the 2015, 2016 & 2017 AACTA Awards as well as the National Gallery of Victoria’s inaugural Gala in 2017. 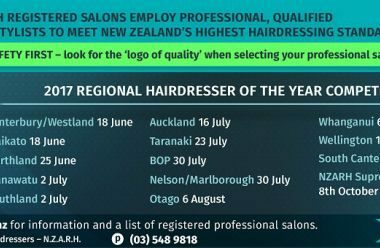 A huge thank you to all our Sponsors of the NZARH​ 2017 Hairdresser of the Year Regional Competitions and their continued support to the industry!! 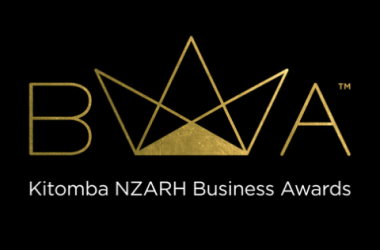 Winners of the 2017 Kitomba NZARH Business Awards announced at the Industry Awards!